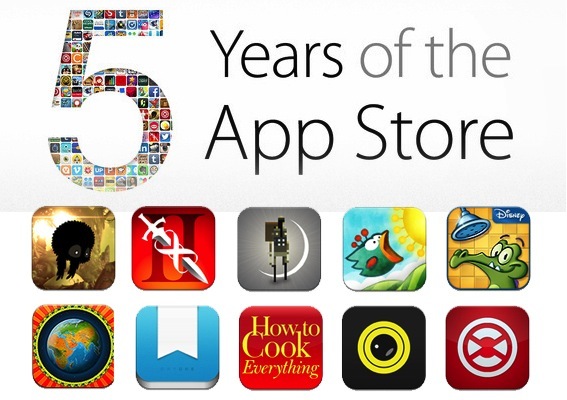 July 10, 2013, Apple’s app store is hitting the five-year mark. Celebrations have already started! It’s not just Apple that’s celebrating the 5th anniversary of its app store, but even the millions, billions and trillions of iOS users. With over a 50 billion apps downloaded already, Apple seems to take this occasion to offer great deals on certain popular apps. Well, Apple has made a really nice switcheroo and it’s going to be the users receiving presents. Yes! Apple has slashed the prices of top apps and games for iPhone and iPad. To make it even more clear, Apple is now offering the most popular apps for free. It’s actually the gifts given by Apple to its users for this occasion. With a new ‘5 Years of the App Store’ section, Apple is giving away the top 5 games and top 5 apps at no cost. Apart from the free apps and games, the new section also features a timeline of the App Store’s milestone achievements. With the launch of iPhone in the year 2007, Steve Jobs announced that developers could really write apps for the iPhone, by creating Web apps. At first, this pronouncement faced a lot of critics and the developers scoffed at it. But later, they started to jailbreak their devices, just to create software for the revolutionary device. With this, in March 2008, Apple included the SDK (software development kit) especially for the programmers to create their apps. The company also promised to provide the developers with a storefront to sell their created software. As promised, on July 10, 2008, Apple launched the app store in around 62 countries. And now, with millions and millions of apps, billions and billions of dollars, the app store is unquestionably a smashing and matchless success. Five years back, it was the same day when Apple rolled out the app store in 62 different countries with just 552 applications at not more than a cost of $1 and $10. And there have been merely just 135 apps available for free. To name a few, Facebook, MLB.com At Bat, Shazam, Yelp and Super Monkey Ball, were the popular ones. The every first weekend after the launch marked more than 10 million downloads. In less than a month, the popular app – Sega’s Super Monkey Ball hit 300,000 downloads. By September 2008, the app store surpassed the milestone of 100 million downloads. In January 2009, when the store offered more than 15,000 apps, Apple announced the achievement of 500 millionth app downloads. Later, in a span of 3 months, the App store hit the mark of 1 billion downloads. In September 2009, the number of downloads was more than 2 billion with around 85,000 applications from 12,500 developers. In January 2010, the download count soared to past 3 billion. By June 2010, Apple announced that the matchless app store offering 225,000 apps (11,000 optimized for iPad) have eclipsed 5 billion downloads. In January 2011, the app store surpassed the 10 billion downloads mark. With the launch of iPad 2 in March 2011, the total number of iPAD-specific apps zoomed by 65,000. Apple’s App store reach also swelled to 123 countries across the globe. After the launch of iPhone 4S in October 2011, the number of apps in App store increased to half a million, with downloads more than 18 billion. By January 2012, the 25 billion downloads mark was achieved and the company announced that a billion apps is being downloaded on an average every month. Needless to say, the app store has more than 900,000 apps awaiting to be downloaded. While some experts believe that App store has revolutionized the world of software businesses, some might say that it’s just an even more convenient way to get required software. Within just the period of 5 years, the app store grew from the curiosity to one of the dominant destinations for software downloads. And, this is not going to end! In the years to come, Apple will continue to boast of impressive App store milestone achievements like 100 billion downloads, $50 billion paid to developers, 1 billion applications, and on and on. However, the real achievement of the App store is the never-ending joy you feel and the ever-increasing time you spend on downloading apps. So, have you downloaded all these apps? What are your thoughts about this celebration gift from Apple? Share your thoughts in your comments. I will be get back to you in a while.